Every great team needs the ability to rush the quarterback. In PFF’s recently released Foundation Draft in fact, the first non-QB selected was Joey Bosa, a second-year edge defender who showed elite ability at rushing the quarterback as a rookie. Despite a general wherewithal of the overall importance of pass-rushers, there still seems to be plenty of debate as to what actually makes up an elite pass-rusher. While often times it’s the players who tally the highest sack totals that get heaped with praise, simply using those totals to define who is and who isn’t an elite pass-rusher is an extremely unreliable, and frankly in 2017, lazy method. Pressure comes in a variety of forms and pass-rushers have a great ability to positively affect any given play for their team, even if they aren’t finishing the play off with a sack. 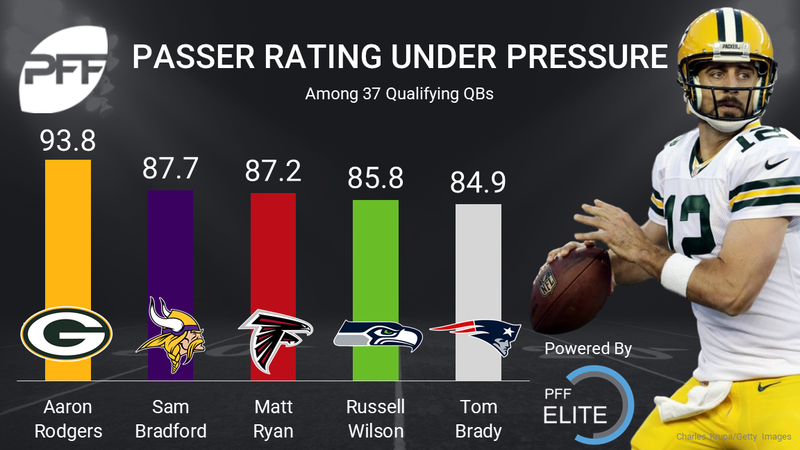 When looking at passer ratings from last season you can easily see the drastic effect that pressure can have even when the quarterback is still able to get off a pass: Aaron Rodgers led 37 qualified quarterbacks last season with a 93.8 passer rating while under pressure; 27 of those signal callers had a passer rating higher than 93.8 on attempts coming from a clean pocket. 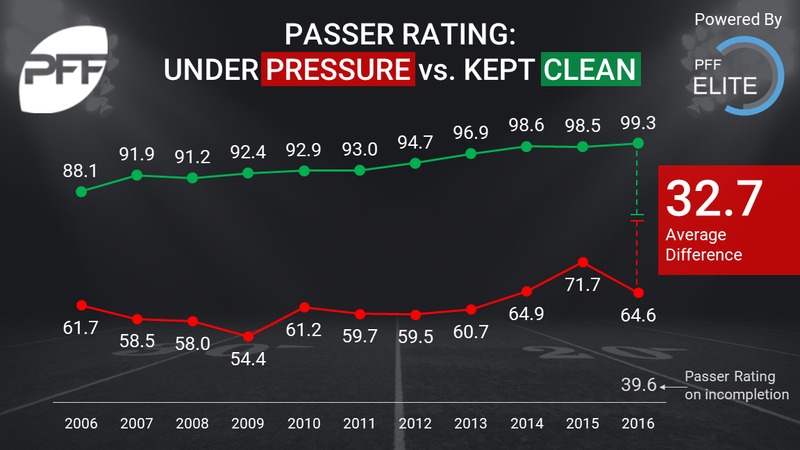 The average NFL passer rating fell from 99.3 to just 64.6 last season when pressured. Here at PFF, one of our overarching goals is to simply make football fans smarter. We watch every play under a magnifying glass in order to provide the public with more information than they’ve ever had access to. 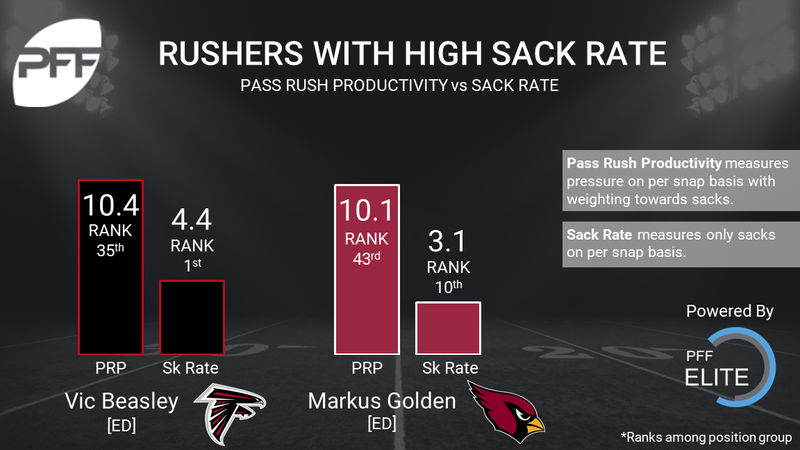 As part of our efforts to debunk the myth that sack rates are a true measure of a players’ ability as a pass-rusher, we’ve developed our own metric called Pass-Rush Productivity (PRP). PRP measures all pressures created on a per-snap basis (hurries, hits and sacks) with a slight weighting towards sacks. PRP allows you to look at a group of pass-rushers and paint a much clearer picture on the level of impact they have on all passing plays, not just the ones that end in a sack. With the knowledge of just how much a quarterback’s throws are effected by pressure, would you prefer a player who finishes the season with double digit sacks but a low overall pressure total? Or a player who may only tally six or seven sacks but is consistently getting into the pocket to disrupt throws? You want the player who’s consistently disrupting throws and PRP helps to identify who those players are. So using PRP, lets take a look at some of the players who deserve more credit than they’ve gotten for their performance as a pass-rusher in 2016. There is no single-greater example as to why you can’t rely on sack totals to distinguish who is an elite pass-rusher from who isn’t than Brandon Graham. Graham – an edge defender who’s primary job is to rush the quarterback – finished this season ranked ninth overall in PFFs Top 101 Players despite tallying just six sacks. Yep, you read that correctly. We considered Graham to be one of the 10 best players in football last season despite ranking 18th among his position group alone in sacks. Why? Because despite the low sack total, Graham absolutely wrought havoc in the pocket last season, lots of it. Graham finished with 83 total pressures, the second most among all 4-3 defensive ends, trailing just Olivier Vernon, who required 156 more pass rush attempts than Graham to tally 86 pressures. Graham didn’t have a single game where he recorded multiple sacks in 2016, but he had nine games where he recorded at least five pressures, including a Week 8 performance where he abused a typically impenetrable Cowboys offensive line to the tune of 11 pressures. Graham alone brought pressure on almost a quarter of all passing plays the Cowboys ran that day. 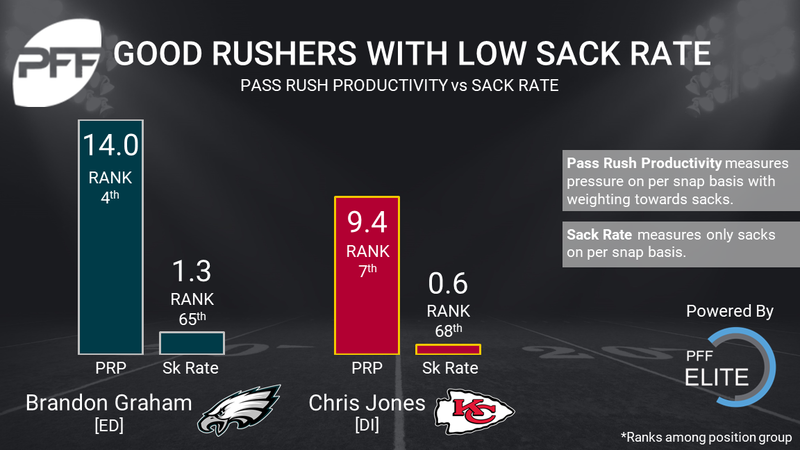 If you were to just look at Chris Jones’ sack total from last season you might conclude that he had a disappointing rookie season as a pass-rusher, but that really couldn’t be further from the truth. Jones’ 42 total pressures were the eighth most among 3-4 defensive ends and Mike Daniels was the only other 3-4 end to record at least 40 pressures on fewer than 440 pass rush snaps (Jones did it in just 341 snaps). 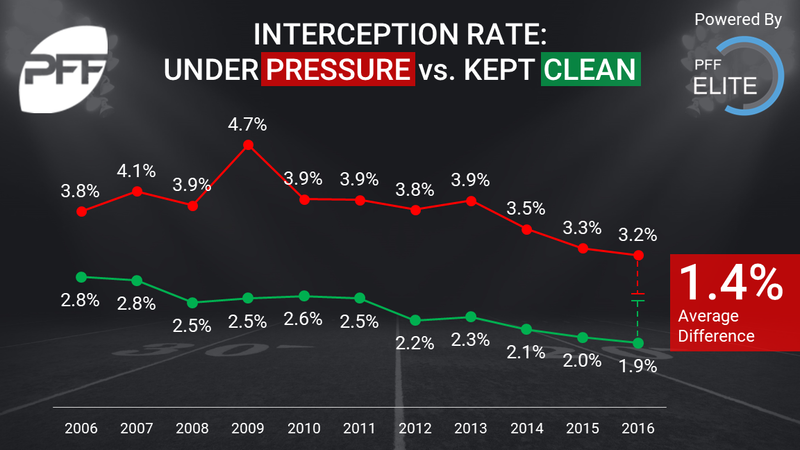 It’s tough to overstate the effect that pressure from the interior can have on a quarterback and Jones provided an extraordinary amount of it for the Chiefs as a rookie. If he can build upon that performance in 2017, he’s going to quickly emerge as one of the most impactful pass-rushers in the entire league. Now using PRP, lets look at some pass-rushers who’s 2016 wasn’t as impressive as their sack totals would suggest. Vic Beasley had a great season, and finishing 29th among 110 qualified edge defenders in pass-rushing productivity is nothing to scoff at and he’s a player that Falcons fans should certainly be excited about. With that being said, since Beasley led the league in sacks last season, many people would see that and conclude that Beasley was the premier pass-rusher in the NFL last year and that would be a pretty big misrepresentation of his true performance. Beasley finished the year with 45 total pressures. Despite besting Khalil Mack by five sacks, Mack had more than double (96) the number of pressures that Beasley had. Beasley had at least five pressures in just five games while having zero games in which he recorded double-digit pressures; Mack had ten games with at least five pressures last year, including three that reached double-digits. If Beasley is going to force himself into the conversation in terms of elite pass-rushers, he’s going to need generate pressure much more consistently, because he will be very unlikely to repeat his conversion rate of notching a sack on 28.5 percent of all of his pressures in 2017 and beyond. Despite ranking third among all defenders with 13 sacks last season, Golden just barely made it inside the top-40 among edge defenders in PRP; and his 77.0 pass rush grade also ranked 34th among the group. There were 14 3-4 outside linebackers who rushed the quarterback at least 400 times last season, Golden ranked 10th among those defenders with 53 total pressures. 23 other 3-4 OLBs alone generated pressure at a greater rate than Golden (once every 8.0 pass rushing snaps). Golden is in a similar boat as Beasley. He had a great season (his 81.5 overall grade ranked 24th among 109 edge defenders) and is by all means an up-and-coming player that Cardinals fans should be excited about… he just wasn’t quite the dominant pass rushing force his sack total suggests he was.